This quilt ended up on my hospital bed when I had my second child. While we waited to find out if her health was golden this quilt kept my spirits up and helped me feel swaddled in flowers in the murky flourescent. 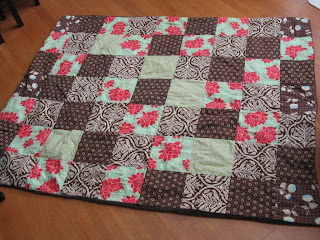 Did I mention this whole quilting/ sewing fiesta came from a raging case of pregnancy nesting. I have come unleashed again, and I like it.